A 67-year-old female with a FIGO (an International Federation of Gynecology and Obstetrics) stage IIIC endometrial cancer developed a left upper lobe lung nodule 1.5 years after initial treatment. The lesion was closely followed with imaging, and continued to increase. A fine-needle aspiration of the mass guided by computed tomography (CT) was ordered and found a poorly differentiated adenocarcinoma consistent with endometrial origin. The patient underwent stereotactic body radiotherapy (SBRT) to the lung lesion to a total dose of 50 Gy in 5 fractions (Figure 1). One- and 4-month follow-up scans showed a continued decrease in the size of the lesion, however, 8 months later, a confluent infiltrating mass, which was also hypermetabolic on PET, was seen in the same area. After multidisciplinary discussion, a left upper lobe lobectomy with mediastinal lymphadenectomy was performed, which found no evidence of malignancy in the lung or dissected lymph nodes. 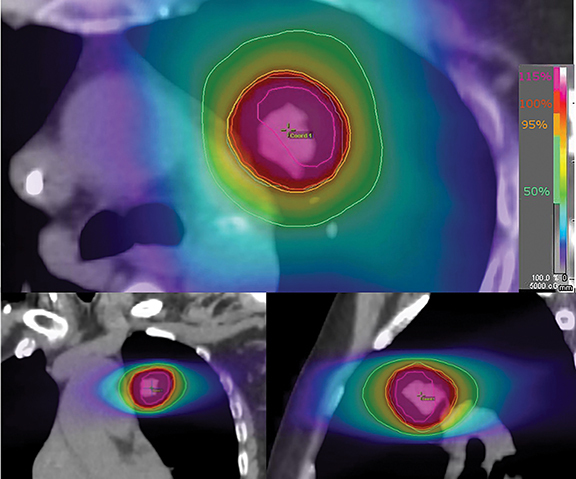 The patient initially was found to have a 1.5 × 1.7-cm left upper lobe pulmonary nodule with an associated positron emission tomography (PET) standardized uptake value (SUV) of 5.69. A CT scan of the chest 1 and 4 months post-SBRT found further decrease in the size of the nodule. At 9 months, a confluent infiltrating mass measuring 4.7 × 2.0-cm was seen with an associated PET SUV of 3.55. Final pathologic diagnosis from the patient’s lobectomy was consistent with benign inflammatory changes of the lung. Differential diagnosis of this patient includes residual disease, recurrent tumor, infection, lobar collapse, and lymphangitic carcinomatosis. 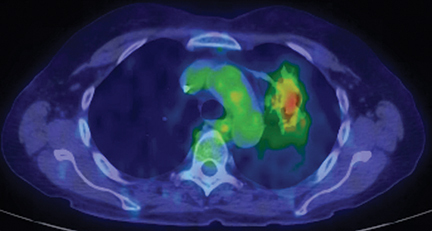 Stereotactic body radiation therapy (SBRT) is now frequently used for the treatment of early stage non-small cell lung cancers and oligometastatic disease of the lung. Understanding the radiographic changes after SBRT is important to correctly identify recurrence and administer salvage therapy. This case highlights some of the more salient features of radiographic changes to the lung after SBRT. Many centers in Asia, Europe and the United States have adopted the Ikezoe and Koenig systems to judge CT changes after SBRT.5-7 In this case report, although the mass progressively decreased within 6 months, there was a considerable size increase at 8 months (Figures 2 and 3). These changes are consistent with radiation fibrosis occurring after 6 months. In fact, radiographic changes can continue to evolve even after 2 years.7 PET scans may also aid in the differentiation between benign lung changes and local recurrences. A review of multiple studies looking at post-SBRT PET scans found that maximum SUV values < 5 were correlated with benign lung changes.8 This group also produced an algorithm to predict recurrences. The first branch point is enlargement of CT density around the primary site and consideration of high-risk radiographic findings (Table 1), of which our patient had 4.9 The second branch point is whether the post-treatment PET is > 5 or > than the pretreatment SUV. The final branch point, for those with a high suspicion of recurrence, are for further treatment evaluation based on operability status with either a biopsy, resection, or nonsurgical salvage. For our patient, the maximum SUV was < 5 (Figure 4) and, as predicted, she had no evidence of disease following lobectomy. Patterns of benign CT changes in the lung after SBRT can be assessed using the Ikezoe and Koenig systems. Evolution of these changes can continue to occur even after 2 years. PET SUV of > 5 after 6 months may predict local recurrences. Patients with the typical pattern of radiation fibrosis and SUV of < 5 should be considered for observation. Libshitz HI, Shuman LS. 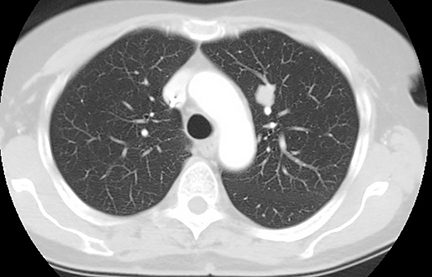 Radiation-induced pulmonary change: CT findings. J Comput Assist Tomogr. 1984;8(1):15-19. Ikezoe J, Takashima S, Morimoto S, et al. 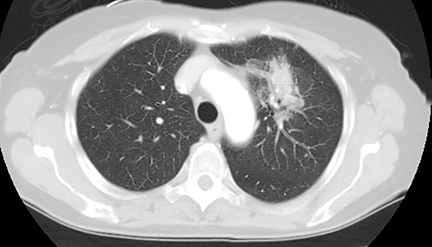 CT appearance of acute radiation-induced injury in the lung. Am J Roentgenol. 1988;150(4):765-770. Koenig TR, Munden RF, Erasmus JJ, et al. Radiation injury of the lung after three-dimensional conformal radiation therapy. Am J Roentgenol. 2002;178(6):1383-1388. Aoki T, Nagata Y, Negoro Y, et al. Evaluation of lung injury after three-dimensional conformal stereotactic radiation therapy for solitary lung tumors: CT appearance. Radiol. 2004;230(1):101-108. Trovo M, Linda A, El Naqa I, et al. Early and late lung radiographic injury following stereotactic body radiation therapy (SBRT). Lung Cancer. 2010;69(1):77-85. Kimura T, Matsuura K, Murakami Y, et al. CT appearance of radiation injury of the lung and clinical symptoms after stereotactic body radiation therapy (SBRT) for lung cancers: are patients with pulmonary emphysema also candidates for SBRT for lung cancers? Int J Radiat Oncol Biol Phys. 2006;66(2):483-491. Dahele M, Palma D, Lagerwaard F, et al. Radiological changes after stereotactic radiotherapy for stage I lung cancer. J Thorac Oncol. 2011;6(7):1221-1228. Huang K, Dahele M, Senan S, et al. Radiographic changes after lung stereotactic ablative radiotherapy (SABR)--can we distinguish recurrence from fibrosis? A systematic review of the literature. Radiother Oncol. 2012;102(3):335-342. Mattonen SA, Palma DA, Haasbeek CJ, et al. Early prediction of tumor recurrence based on CT texture changes after stereotactic ablative radiotherapy (SABR) for lung cancer. Med Phys. 2014;41(3):033502. Radiation Oncology Case: Radiographic changes of the lung after stereotactic body radiation therapy. Appl Rad Oncol. Prepared by Dr. Park, a radiation oncologist in the department of radiation oncology at the Kansas City VA, Kansas City, Missouri; Dr. McClinton, chief resident; Dr. Deer, assistant professor, and Dr. Wang, associate professor and program director, department of radiation oncology, University of Kansas Medical Center, Kansas City, Kansas.